NVIDIA confirmed that support for the 3D Vision products will officially end with next month’s GeForce Game Ready Driver. The product was originally introduced by NVIDIA back in 2008, consisting of a pair of LC shutter glasses, an infrared emitter device and compatibility with 120Hz LCD displays, although select CRT monitors, 3LCD and DLP-projectors are also compatible. Each lens of the glasses operates at 60Hz to create a 120Hz tridimensional experience based on the good old concept of stereoscopic vision. The result is the illusion of depth in the viewer’s eyes as if the display itself was a window of sorts. 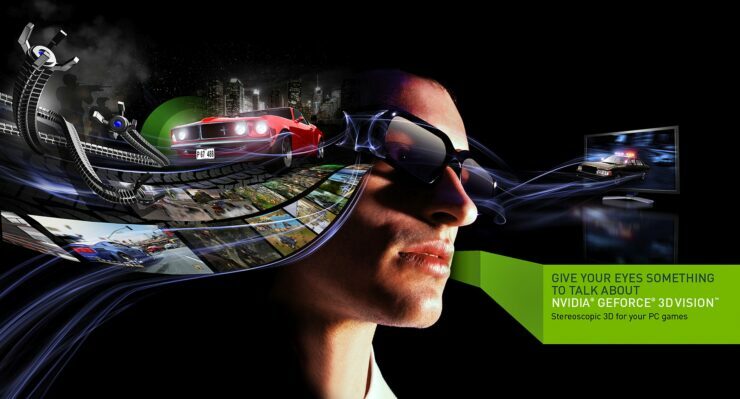 NVIDIA produced a driver software that handles automatic conversion of 3D games into stereoscopic tridimensional vision. However, without ad hoc optimization the quality of the experience was usually subpar with plenty of artifacts in sight. Additionally, prolonged usage of 3D Vision often resulted in headaches for the player, not to mention that the performance of games was basically cut in half as two images had to be rendered in order to enable stereoscopy. Most of these issues are now present in VR devices as well since Virtual Reality technology is also fundamentally based on stereoscopy. In 2011, NVIDIA released the 3D Vision 2 kit with upgraded glasses, featuring 20% larger and more comfortable lenses which allow a greater field of view, 1080p resolution per eye and reduced ghosting. However, even these improvements weren’t enough to drive adoption beyond a small niche of 3D fans. You can find the official list of games compatible with NVIDIA 3D Vision on this page.